At Voxox -- a company that's run by a father and three brothers -- we feel that family is important. And that means that we support causes that help families. Today we announced our endorsement of the Dr. Alfonsina Q. Davies Epilepsy Foundation. It's a great cause with a touching family story. Take a look at the press release below and please consider supporting this foundation (http://ninascourage.org). SAN DIEGO – June 10, 2015 – Voxox®, the most comprehensive cloud-based rich communication service for consumers and businesses, today announced its endorsement of the Dr. Alfonsina Q. Davies Epilepsy Foundation. Voxox has been an advocate for the organization in a variety of ways, including volunteering marketing, design, and event management resources to help promote the cause. Voxox is encouraging its community to support this new foundation in meeting its epilepsy research, treatment and awareness objectives. The Dr. Alfonsina Q Davies Epilepsy Foundation was formed by Thomas and Nadia Davies in honor of their daughter, Dr. Alfonsina ("Nina") Quintana Davies, who had epilepsy from birth. Nina Davies suffered with the disorder for 52 years, ultimately succumbing to SUDEP (sudden unexpected death in epilepsy). Most people are not aware that epilepsy kills more Americans than breast cancer (Epilepsy.com; Cancer Facts & Figures 2015). After Nina’s passing, Thomas and Nadia Davies have pledged their lives to help those afflicted with epilepsy. Among other initiatives, they have instituted an Academic Chair for Research in Epilepsy at the University of California, Los Angeles. Dr. Gary Mathern, professor of pediatric neurosurgery and director of the UCLA Pediatric Epilepsy Program at Mattel Children's Hospital has been appointed to the Chair. "We at Voxox have been incredibly touched by the Davies family story and Nina's courageous battle with epilepsy," said Bryan Hertz, CEO of Voxox. "As a business operated by a father and three brothers, Voxox is particularly attuned to the importance of family, and this cause spoke to us because life-long illnesses, such as epilepsy, are debilitating to families. We invite our community to consider supporting the Dr. Alfonsina Q. Davies Epilepsy Foundation." Increase the research that is being conducted to treat and cure epilepsy through the Dr. Alfonsina Q. Davies Endowed Chair for Research in Epilepsy, established at UCLA. It is the only Academic Chair at UCLA for this purpose. Establish the “Dr. Alfonsina Q. Davies Epilepsy Treatment Center” at a major university medical center. Current practice in epilepsy treatment is to focus on the disorder and treat it through medication, implant or surgery, but not all epilepsy patients can have their seizure disorder significantly suppressed or eliminated. The center will be staffed with counselors, social workers, psychologists and psychiatrists who specialize in the treatment of those with epilepsy. Create empathy in the general public for those with epilepsy. One in ten Americans will have a seizure in their lifetime (Epilepsy.com) and one in 26 will develop epilepsy (Epilepsy Across The Spectrum). Unlike other illnesses the psychosocial trauma that individuals with seizures suffer impacts their lives almost as much as the seizures themselves. One of the foundation's goals is to diminish the stigma and discrimination that is associated with epilepsy today. "Our Nina was treated for seizures all of her life, but we were never able to find someone that understood or could treat her for the emotional distress that she lived with everyday, fearing a seizure in public and the consequences it would bring," said Thomas Davies, PhD. "We would like to help people 'walk in the shoes' of someone with epilepsy, and we hope that our foundation's programs and future plans will make progress." 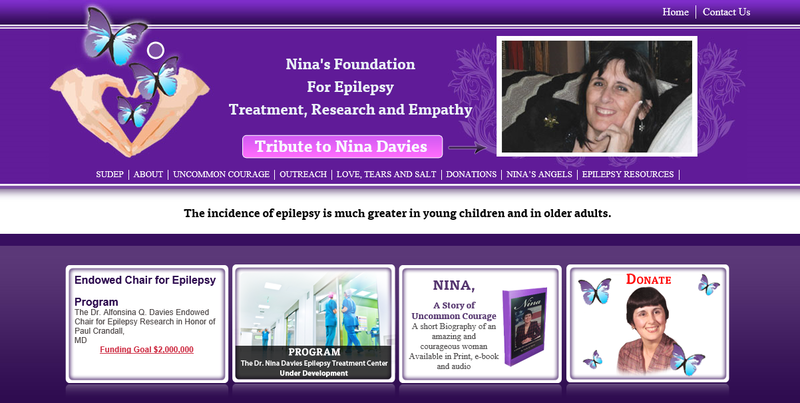 To learn more about epilepsy and the Dr. Alfonsina Q. Davies Epilepsy Foundation programs, please visit http://ninascourage.org/foundation-outreach/. If you wish to support this foundation you can find all the pertinent information at http://ninascourage.org/donations. All donations are tax deductible.